Offering medical operational capability to service personnel across the world. This includes The British Army, Royal Air Force and Royal Navy and reservist organisations such as the Territorial Army (TA). Services are required through times of conflict as well as through peace time. As a GP, care is typically extended to service personnel families. However a large variety of specialities are required, encompassing both primary and secondary care. Cadetships – Careers can commence early through sponsorship at medical school. Cadettes apply and are attached to their interested organisation. Increasingly competitive as each force will often sponsor their cadet to aid tuition fees with the return of continued service after qualification. Direct Entry – Doctors can still join once qualified. If speciality training is sought then age limits are in place. GP’s and Hospital Consultants are more often taken, ie once speciality training has completed, in one of several specialities. Age limits are in place depending if applying for training or you are already qualified. The Defence Postgraduate Medical Deanery (DPMD) is responsible for commissioning postgraduate medical training. This can take place in NHS Ministry of Defense hospitals, specialist units, some of which are abroad. Once completed, consultants will often be deployed for a few months every year. Varied cases, A&E, GP are similar in breadth of cases but by no means conflict pathology encountered and often the age and physical background of patients. 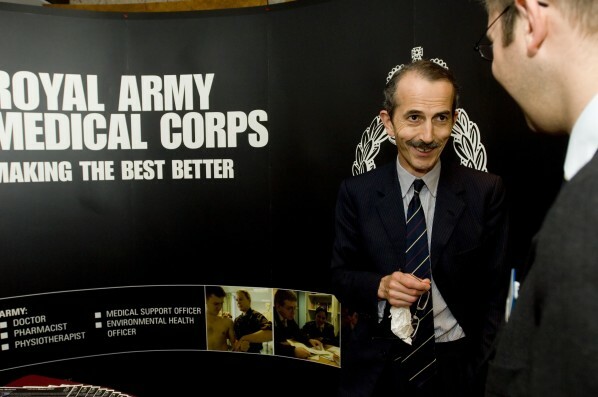 Bursaries and Cadetships offer financial support at undergraduate level (£3000 pa and c. £15000 pa respectively (www.raf.mod.uk/careers/jobs/medicalsponsorship). In times of need, certain specialities applying to particular armed forces can receive a welcome bonus. Military GP’s receive above average pay but will rarely achieve the highest level by NHS counterparts. Service commitment hours can be unpredictable, demanding and varied. Rewarding mixture of clinical and a military life is experienced by all. The later includes going on exercises with fellow members, to military training, for example the all arms commando course with The Royal Navy or aviation medicine with the Royal Air Force. Often assumed to be a long-term commitment, a cadetship will typically follow with six years of service. However there are short military contracts on offer too. The opportunity to develop postgraduate interests, clinical specialisation and even extend training with overseas forces is supported. Often commented that the degree of autonomy and independent practice is supported much earlier than peers in the NHS. However the training time line when compared to NHS colleagues is often longer, potentially years. At times of conflict, retrieval of injured medical personnel can be challenging and although rare, it can include the very real dangers faced by fellow service members. Informal discussions with dedicated careers team in each force, (such as the RAF: Medical Branch Recruitment Office can be contacted on 01400 266811 or you can email CRN-DRIT-RAFREC-MDL T-SO3@mod.uk.). Teams are exceptionally helpful, with clear honest advice.